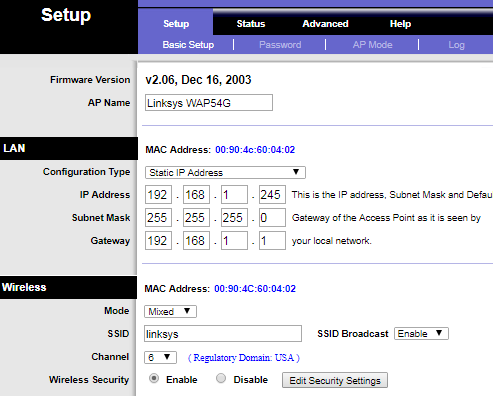 Checking or verifying the wireless settings on a Linksys access point is important when connecting wireless devices to your Wi-Fi. This is useful if you are unsure of your access point’s wireless settings. Open the access point’s web-based setup page. For detailed instructions, click here. If you are using a Mac® computer to access the web-based setup page, click here. QUICK TIP: To determine the access point's IP address, you may refer to the router's DHCP client table. For instructions, click here. 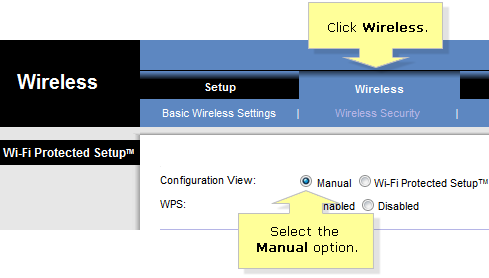 On the Setup page, click Wireless and set the Configuration View to Manual. NOTE: If you have an older access point and the web-based setup page looks different, just go to Setup > Basic Setup then scroll down to the Wireless section. Take note of your SSID then click the Edit Security Settings button to check your security settings. Look for the Network Name (SSID) under the Basic Wireless Settings section. It is recommended to change it to a unique SSID to easily determine your network. 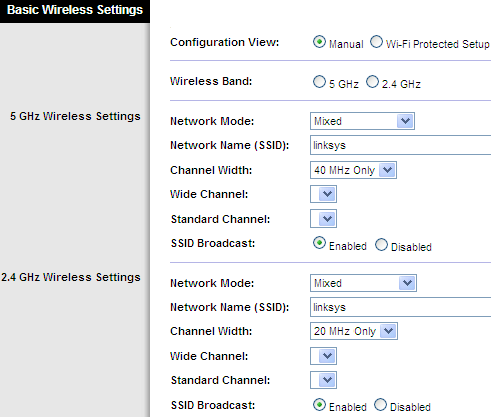 NOTE: Check the wireless settings of both the 2.4 GHz and 5 GHz bands (if applicable). Click Wireless Security and take note of the current Security Mode and Security Key/Passphrase.